Many people use smartphones to play music or record sounds. Due to the fast pace of technological change and fierce competition, consumers have high expectations of smartphone audio performance. Audio tests are usually subjective, but Allion applies objective laboratory methods to detect differences in smartphone audio quality. 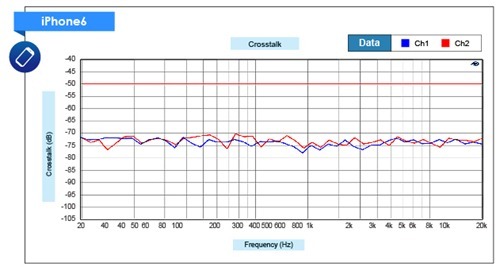 This is the third article in our Smartphone User Experience Analysis series and the first article to focus on Audio performance. 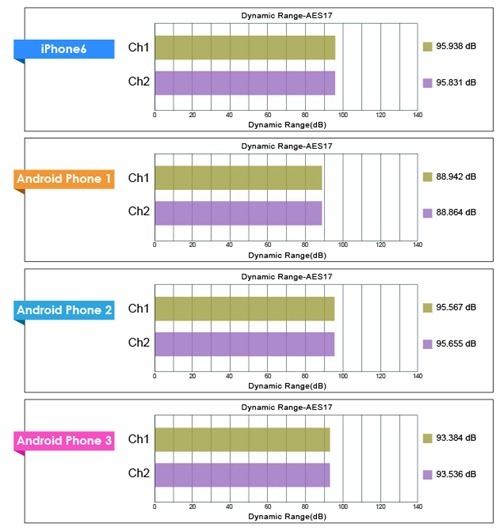 This article describes audio input testing that we performed as part of a competitive analysis of several smartphones. 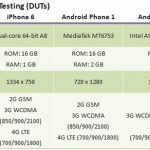 These smartphones (DUTs) are listed by column in the table below. · Audio Output Testing measures the audio quality from digital signal to analog signal (D/A), such as built-in microphone or headphone microphone jack. 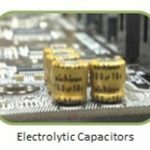 This test item measures maximum output voltage. If the distortion exceeds 1% of the original signal, the sound waves are usually truncated, which makes for a poor listening experience. The common setting of this test item was to play 0 dBFS file and output voltage required more than 300 mV. This result established a reference maximum distortion value that was used in subsequent tests. Distortion rate less than 1% and has more than 300 mV output voltage. 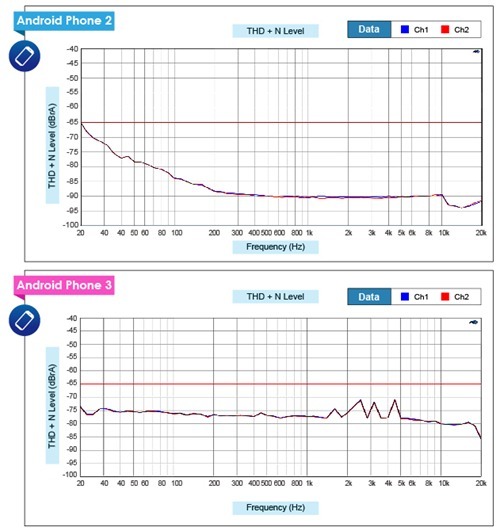 The test results showed that the iPhone 6 and Android Phone 2 had higher voltage (more than 1 V) at 1 kHz; meanwhile, these two smartphones had lower distortion. 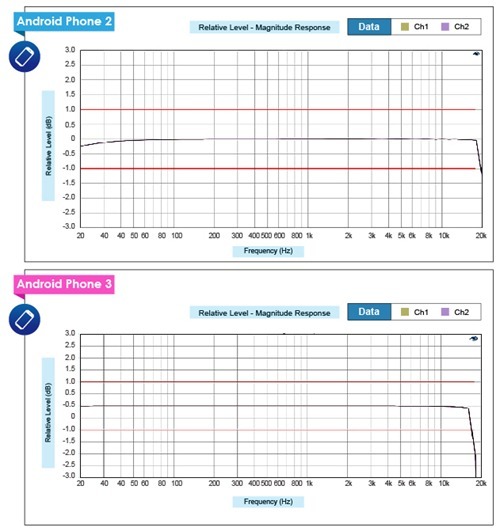 Android Phones 1 and 3 had similar distortion rates, but the Android Phone 3 had greater output voltage. 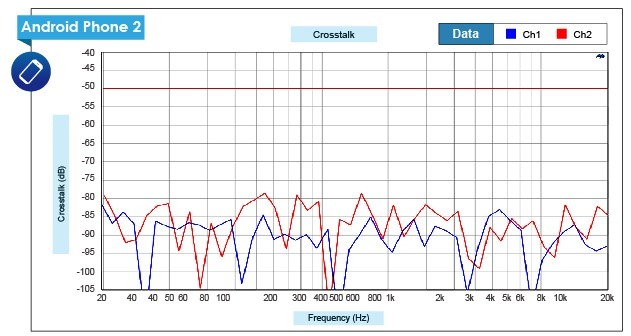 In the full frequency range (20 Hz – 20 kHz), values should be ≦ -65 dB. We used 44 kHz and 48 kHz sampling audio files to test. 44 kHz is the common sampling rate for audio testing. We tested 48 kHz audio samples because we used it to find resampling errors in Android systems, which resulted in too much distortion and attenuation. 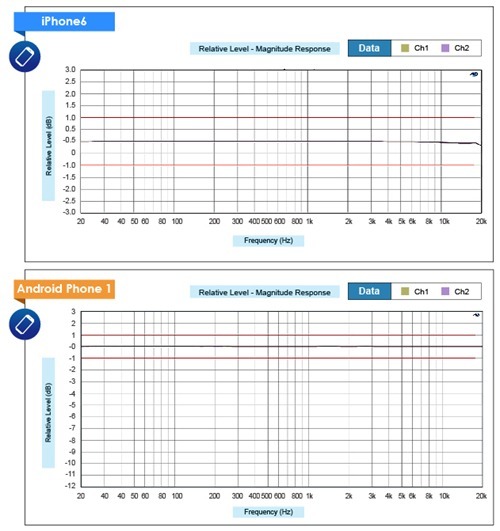 When we played the 44 kHz sample audio file, the iPhone 6 and Android Phone 2 had -85 dB to -90 dB of distortion in the middle and high band frequencies. But in the low band frequency, the Android Phone 2 produced more distortion than the iPhone 6. 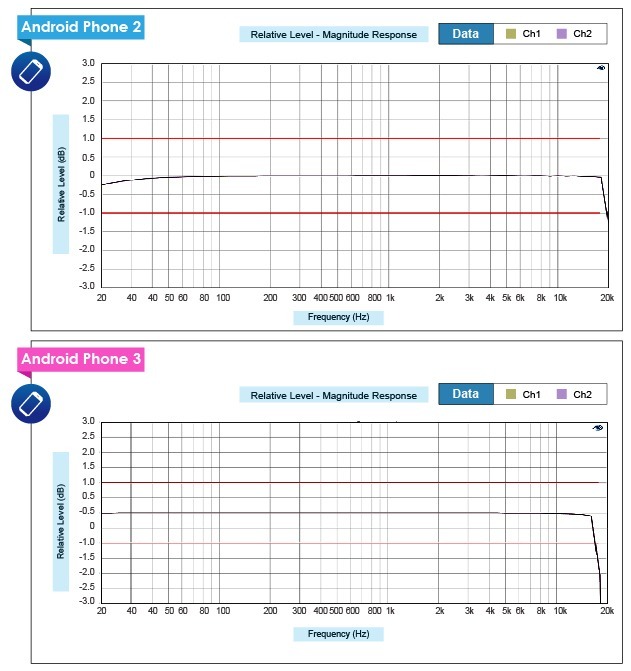 On the other hand, the Android Phone 3 had the poorest performance among the DUTs because its distortion was higher than -80 dB in full frequency mode. When playing the 48 kHz sampling audio file, the distortion performance was very similar to the 44 kHz results and no resampling errors occurred in any of the DUTs. 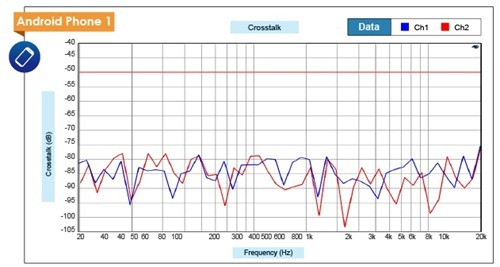 To measure the distance between the reference signal and noise at 1 kHz frequency. This test shows the total amount of noise between the DUT and its surroundings. Value≧ 85 dB ( The ideal value for a 44 kHz 16-bit sample is 96 dB). Most DUTs had results above 90 dB, except for the Android Phone 1. 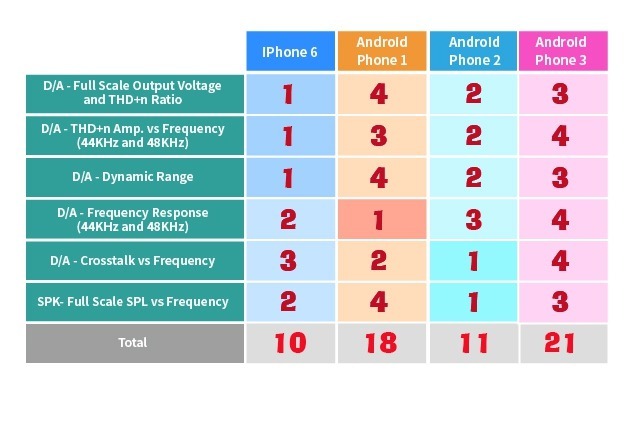 The iPhone 6 and Android Phone 2 were closest to the ideal value (96 dB), which is the maximum dynamic range of 16-bit audio. 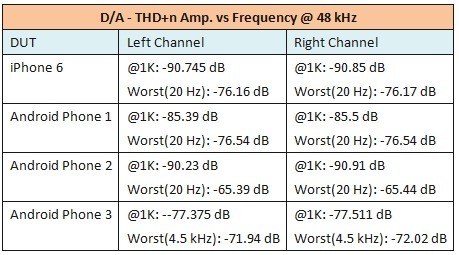 In the figure below, CH1 represents the left channel and CH2 represents the right channel. 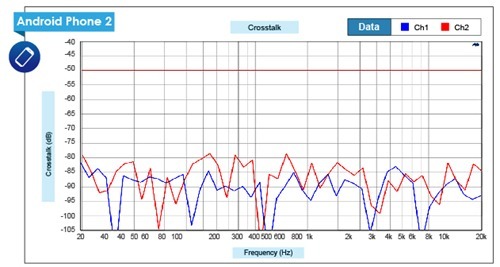 To examine the attenuation of output and original signals in the full frequency range. · Low/High frequency attenuation cannot go over ±1 dB. · The middle area of the curve cannot fluctuate more than ± 0.25 dB. With the 44 kHz sampling audio file, the Android Phone 1 test results were a straight line, which indicates good performance. 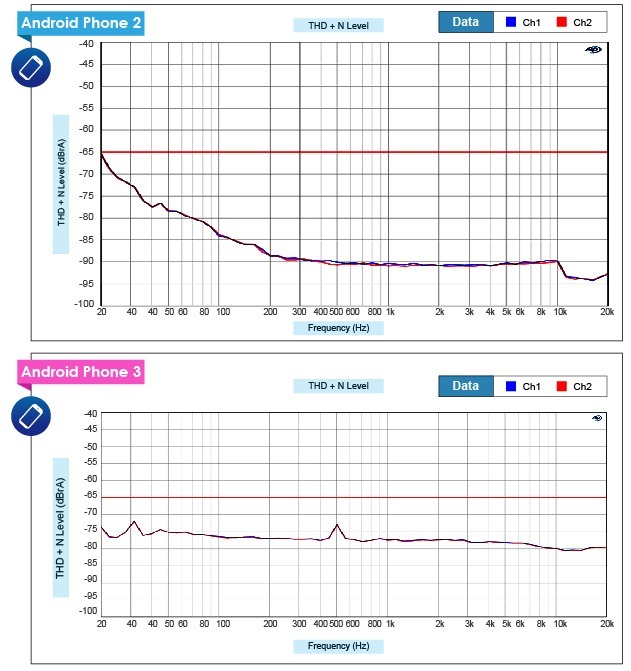 The rest of the curves looked smooth in the middle section of the graph, but the iPhone 6 had a tiny amount of attenuation at 20 KHz. 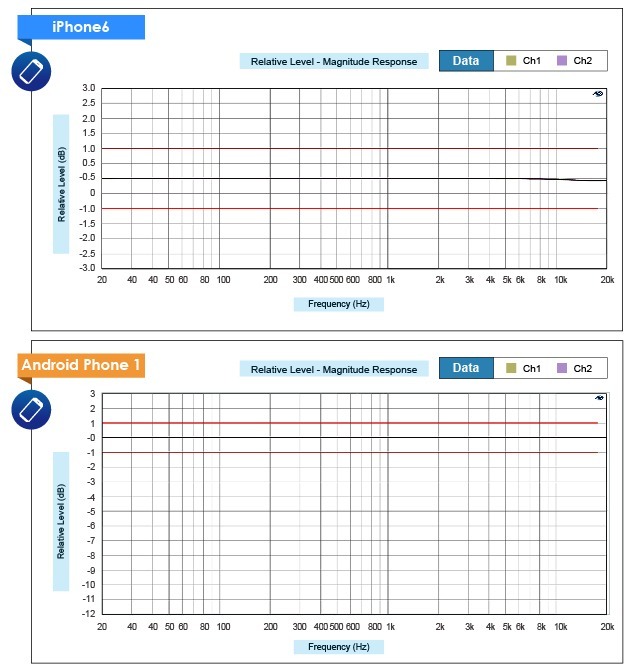 The replay capability of Android Phone 2 could reach 19 kHz, but the Android Phone 3 only supported 17.6 kHz, meaning that it had the worst performance. When we played the 48 kHz audio sampling file, DUT performance was quite similar. 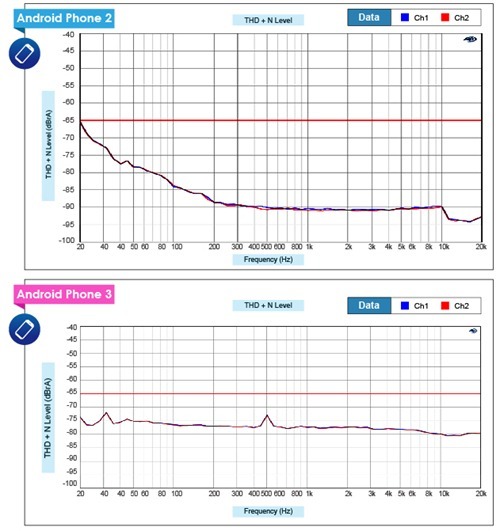 All the test devices performed well in full frequency replay with no resampling error. 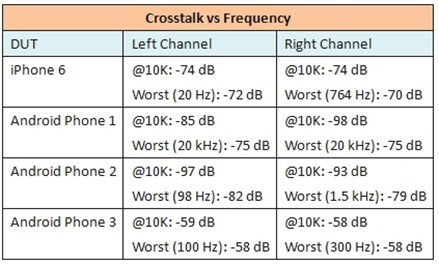 To examine the ratio of stereo signal with no sound at full frequency and the other channel with sound at full frequency. This ratio will reveal if any crosstalk is occurring between channels. 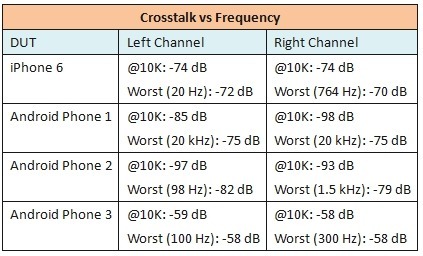 If crosstalk occurs between the two stereo signals transmitting different messages, it will degrade the audio quality by interfering with stereo transmission, soundstage, and positioning. We used two checkpoints for this test item; the first being the standard checkpoint of 10 kHz and the second being the worst performance checkpoint. Our measurements show that the Android Phone 2 performed best, with nearly -80 dB at full frequency. 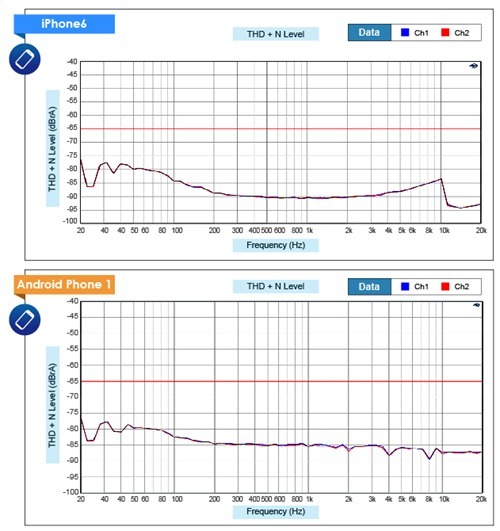 The Android Phone 1 remained under -75 dB and the iPhone 6 reached a level of -70 dB. The Android Phone 3 scored worst at around a 60 dB level. To test the speaker capability to revert to normal signal. 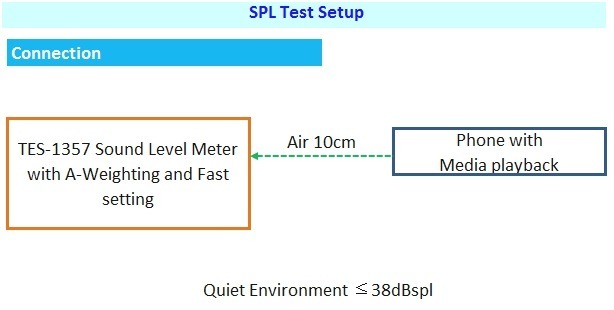 We conducted this test in a quiet room with an ambient noise level of 38 dBspl. Measurements were made at intervals of 1 second (Slow) and an A-weighted value was deducted from each reading. We played 23 different audio file frequencies at maximum digital signal (0 dBFS) and used the TES-1357 sound level meter to measure the audio pressure at each frequency. During the test, the sound level meter was just 10 cm away from the DUT speaker. This allowed us to measure the sound directly without interference or echo effects. Some DUTs had two built-in speakers. In order to be fair, all the measurements focused on the sound quality of a single speaker. Our measurements show that the Android Phone 2 had less attenuation at high frequencies and that its performance in low frequencies was close to the iPhone 6. 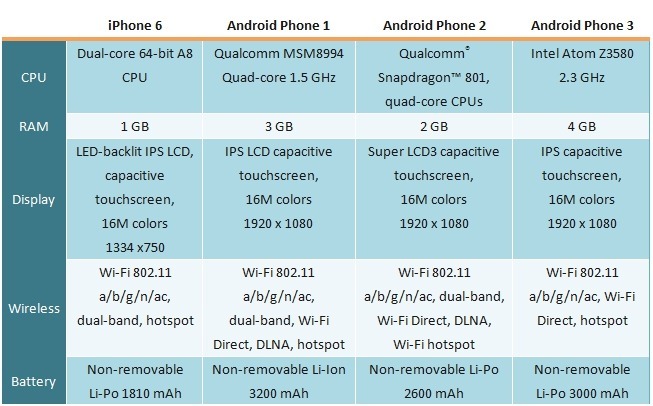 Hence, the Android Phone 2 performed best on this test. The sound pressure performance of the iPhone 6 and Android Phone 3 were quite similar. 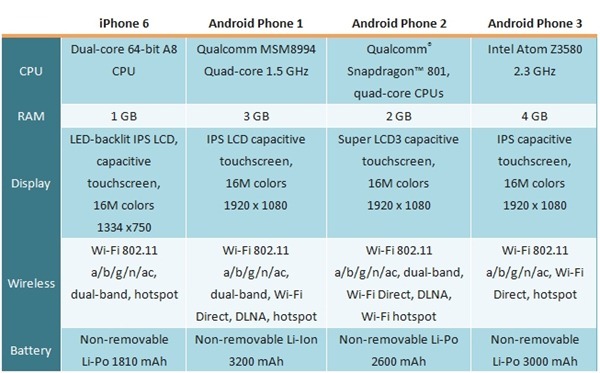 The Android Phone 1 showed the worst performance, especially at high frequencies . In the summary table below lower scores indicate better quality. 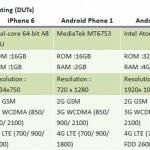 This table shows that the iPhone 6 performed best. 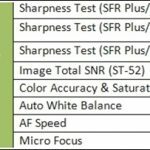 Android Phone 1 had poor performance on distortion and background noise, while the Android Phone 3 did performed poorly on all the tests. 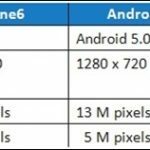 In contrast, the Android Phone 2 performed slightly worse than the iPhone 6 overall. 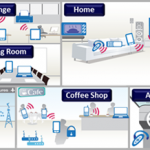 Our next smartphone testing article focuses on audio input testing. Stay tuned to this channel for the next installment in the series! If you missed any of the previous articles in this series, you can find links to them in the Related Articles section below.